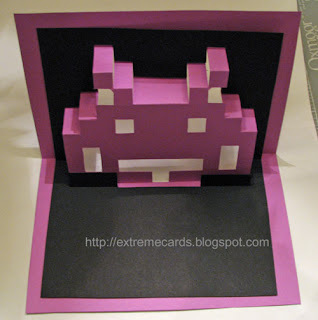 How to make an origamic architecture pop up space invader card. 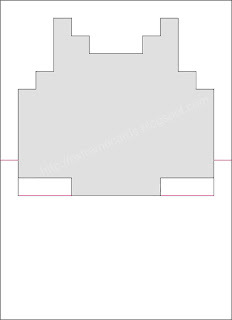 Suitable for machine or hand cutting. Page 1 looks like this. 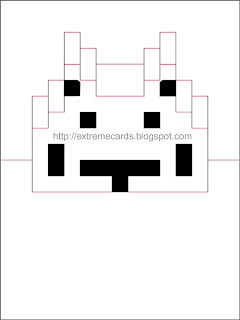 Page 2 looks like this. Cut page 1 and 2 from contrasting paper colors. I cut page 1 from purple and page 2 from black. Cut pieces on black cut lines. Score on red fold lines. 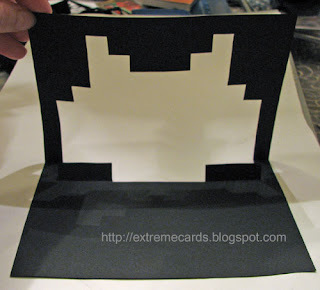 Start working each fold line into place by pushing the space invader from the back of the card and pinching along each fold line on the front. Warning: work on the single cubes at the top very gently. Each is attached to the rest of the antenna by a fragile triangular bridge. Working from the back, push each cube forward, pinching the folds on the back. Start closing the card. 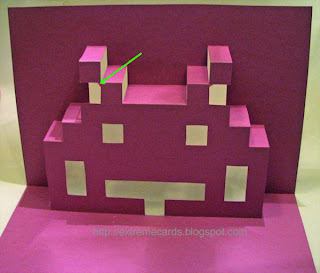 As the space invader collapses, continue to crease each fold line until the piece folds flat. 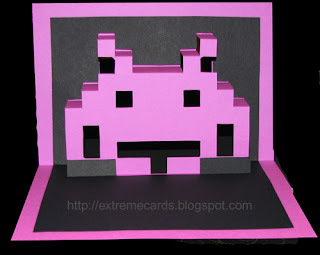 Once the invader is cut and the pop up part is folded, open the invader piece. Slide the background cut out onto it. Check the fit, than spot glue the two parts together. 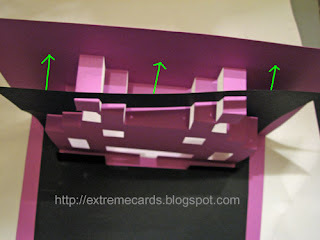 Back the entire piece with another piece of cardstock (mine is black).